Blue's Clues is an American live-action/animated educational children's television series that premiered on Nickelodeon on Sunday, September 8, 1996. Producers/creators Angela Santomero, Todd Kessler, and Traci Paige Johnson combined concepts from child development and early-childhood education with innovative animation and production techniques that helped their viewers learn. The show was originally hosted by Steve Burns, who left in 2002 and was replaced by Donovan Patton until 2006. The show follows an animated blue-spotted dog named Blue as she leaves a trail of clues/paw prints for the host and the viewers, in order to figure out her plans for the day. Blue's Clues became the highest-rated show for preschoolers on American commercial television and was critical to Nickelodeon's growth. It has been called "one of the most successful, critically acclaimed, and ground-breaking preschool television series of all time." A spin-off called Blue's Room premiered in 2004. The show's producers and creators presented material in a narrative format instead of the more traditional magazine format, used repetition to reinforce its curriculum, and structured every episode the same way. They used research about child development and young children's viewing habits that had been conducted in the thirty years since the debut of Sesame Street in the U.S. and revolutionized the genre by inviting their viewers' involvement. Research was part of the creative and decision-making process in the production of the show and was integrated into all aspects and stages of the creative process. Blue's Clues was the first cutout animation series for preschoolers and resembles a storybook in its use of primary colors and its simple construction paper shapes of familiar objects with varied colors and textures. Its home-based setting is familiar to American children but has a look unlike other children's TV shows. A live production of Blue's Clues, which used many of the production innovations developed by the show's creators, toured the U.S. starting in 1999. As of 2002, over 2 million people had attended over 1,000 performances. By 2002, Blue's Clues had received several awards for excellence in children's programming, educational software, and licensing, and had been nominated for nine Emmy Awards. It has been syndicated in 120 countries and translated into 15 languages. Regional versions of the show featuring local hosts have been produced in other countries. It was one of the first preschool shows to incorporate American Sign Language into its content. The show's extensive use of research in its development and production process inspired several research studies that have provided evidence for its effectiveness as a learning tool. Blue's Clues was the longest-running Nick Jr. series until it was surpassed by Dora the Explorer in 2011. In March 2018, Nickelodeon announced a reboot of the series. There was little incentive for producing high-quality children's television until 1990, when Congress passed the Children's Television Act (CTA), which "required that networks be held accountable for the quality of children's programming or risk losing their license". Congress provided little direction in how the CTA was enforced and the law was so vague, no real improvements were made, so the FCC "strengthened its regulations enforcing the CTA" in 1996. The additional regulations included a provision called "the Three-Hour rule", which mandated that broadcasters air at least three hours of children's programming per week, between the hours of 7:00 a.m. and 10:00 p.m., and that they be tagged with an E/I (Educational and Informational) logo. The cable network Nickelodeon, which had been airing programs for six- to twelve-year-olds, was not legally bound by the CTA but complied with it many years before the laws and regulations were passed anyway. Nickelodeon assigned a team of producers, Angela Santomero, Todd Kessler, and Traci Paige Johnson, to create a new U.S. television program for young children in mid-1994 using research on early childhood education and the viewing habits of preschoolers. They did not, according to Tracy, have the traditional backgrounds of most producers of children's programs but "possessed "an amazing combination of talents, backgrounds, and personal attributes". According to The New York Times, Kessler was the first creator to be brought on board to the project; Santomero and Johnson joined soon after. Kessler had a background in children's television, with prior experience on Sesame Street, but he disagreed with its format and thought that it was too static and not visual enough. He also worked as a freelance producer for Nickelodeon from 1993 to 1994. Santomero worked at Nickelodeon as a researcher and Johnson was a freelance artist and animator. Researcher Daniel R. Anderson of the University of Massachusetts Amherst, one of the first researchers to study the effect of television on young children and who had also worked on Sesame Street, was an adviser for the new show. At first, Nickelodeon had hired Anderson as an adviser for its Nick Jr. block of preschool programs starting in 1993, although Santomero had already been getting his input about research informally. When Nickelodeon enlisted her to co-create Blue's Clues, he came on in a more formal capacity. Santomero, Kessler, and Johnson met at the Nickelodeon Studios for a month to develop Blue's Clues. The character Blue was originally conceived as a cat, and the name of the show was to be "Blue's Prints," but the show's name was changed and Blue became a dog because Nickelodeon was already producing a show about a cat. Kessler handled the show's "computer-based production", Santomero the research, and Johnson the design. Alice Wilder served as a producer and director of development and research. They were given a "modest" $150,000 to produce a pilot. Blue's Clues premiered in the U.S. on September 8, 1996. It was a smash hit, largely due to the producers' extensive research, and became crucial to Nickelodeon's growth. Within 18 months of its premiere, Blue's Clues was as well-known as more established children's shows such as the 30-year-old Sesame Street. It became the highest-rated show for preschoolers on commercial television. By 2002, 13.7 million viewers tuned in each week. In 2000, with very little "fanfare" and after 75 episodes, co-creator and co-producer Todd Kessler left Blue's Clues and Nickelodeon, to pursue other projects. He told The New York Times that he had "no hard feelings". He continued to be listed as an executive producer for the remaining run of the show. In 2004, a spin-off, Blue's Room, was launched. It featured puppets instead of animation as well as the original show's second host, Joe, in several episodes. Blue's Clues celebrated its 10-year anniversary in 2006 with a special that consisted of a 12-minute retrospective produced by VH1's "Behind the Music" staff and a collection of "milestone" episodes, including first host Steve Burns' 2002 departure. In March 2018, Nickelodeon announced it would revive Blue's Clues with an order of 20 episodes. The revival will have a new host, a "refreshed signature look", and a switch to CGI animation. The producers of Blue's Clues originally wanted a female host but hired Steve Burns (shown here in 2009) after he received the strongest and most enthusiastic response in tests with preschoolers. The most important casting decision was that of the host, the only human character in the show. The host's role was to empower and challenge the show's young viewers, to help increase their self-esteem, and to strongly connect with them through the television screen. The producers originally wanted a female host, but after months of research and over 1,000 auditions, they hired actor/performer Steve Burns based on the strength of his audition. Burns received the strongest and most enthusiastic response in tests with preschoolers. Johnson said that what made Burns a great children's TV host was that "he didn't want to be a children's host ... He loved kids, but he didn't want to make a career out of it." Burns remained on Blue's Clues for seven years and was in over 100 episodes before he left. Burns himself stated, "I knew I wasn't gonna be doing children's television all my life, mostly because I refused to lose my hair on a kid's TV show, and it was happenin'—fast." Accompanied by a "concentrated multiplatform promotional campaign" that included articles in Nickelodeon's magazine and on its webpage, an arc of three episodes introduced Burns' replacement Donovan Patton, who played Steve's brother Joe. Patton was subjected to the same kind of scrutiny to earn the job, and was selected out of 1,500 auditions. [note 2] Patton had never seen Blue's Clues before he auditioned for the part but, like Burns, was the favorite with preschool test audiences. Burns helped train Patton to perform the role. "We saw Steve Burns' retirement from the show as a chance to put Blue's Clues on a new course," Johnson said. Also, according to Johnson, Joe's character was more like a preschooler and more innocent than Steve. Johnson was cast as Blue's voice because, of the show's crew, she was able to sound the most like a dog. Nick Balaban, who wrote the music for the show along with Michael Rubin, was cast as the voice of Mr. Salt. Balaban initially used a Brooklyn accent for Mr. Salt before settling on a French accent. Rubin also provided the voice of Mailbox. Steve, the host, presents the audience with a puzzle involving Blue, the animated dog ... To help the audience unlock the puzzle, Blue leaves behind a series of clues, which are objects marked with one of her paw prints. In between the discovery of the clues, Steve plays a series of games — mini-puzzles — with the audience that are thematically related to the overall puzzle ... As the show unfolds, Steve and Blue move from one animated set to another, jumping through magical doorways, leading viewers on a journey of discovery, until, at the end of the story, Steve returns to the living room. There, at the climax of the show, he sits down in a comfortable chair to think — a chair known, of course, in the literal world of Blue's Clues, as the Thinking Chair. He puzzles over Blue's three clues and attempts to come up with the answer. Nickelodeon researcher Daniel R. Anderson called the structure of Blue's Clues a game that presented its viewers with increasingly challenging and developmentally appropriate problems to solve. Early episodes focused on basic subjects such as colors and numbers, but later the programs focused on math, physics, anatomy, and astronomy. The show's producers believed that comprehension and attention were strongly connected, so they wrote the episodes to encourage and increase their viewers' attention. They used content and production characteristics such as pacing which gave children time to respond, as well as "camera techniques, children's voices, musical cues, sound effects, clear transitions, repeatable dialogue, and visuals." Participation, in the form of spoken or physical response from the audience, and the mastery of thinking skills were encouraged by the use of repetition, both within the structure of individual episodes and across multiple episodes. The producers used a variety of formal features, which were auditory, and content features, which consisted of invitations given to the audience, such as "Will you help?" The features were also in the form of both recurrent and unique formats and content. The purpose of the recurrent formats and content, which were similar in every episode, was to increase viewers' attention, comprehension, and participation during key educational lessons. Nickelodeon originally aired the same episode daily for five days before showing the next one. The producers believed this telecast strategy empowered young children by giving them many opportunities to master the content and problems presented to them. The creators' and producers' goals were to "empower, challenge, and build the self-esteem of preschoolers" while entertaining them. Kessler, Santomero and Johnson were influenced by Sesame Street, the first children's television program to utilize a detailed and comprehensive educational curriculum developed from research. "We wanted to learn from Sesame Street and take it one step further," Santomero said. Like Sesame Street, formative research which the producers called their "secret sauce," was used during all aspects of the creative and decision-making process during the production of Blue's Clues. In addition to a curriculum that emphasized reasoning skills relevant to preschoolers' everyday lives, the producers wanted to include audience participation, called by Variety its "call and response style," that encouraged mastery of the information presented, positive reinforcement, and prosocial messages. In their first brainstorming sessions in 1994, Santomero, Kessler, and Johnson decided to promote mastery rather than rote learning or memorizing, make sure that their viewers knew the answers to the puzzles with which they were presented, and include elements of surprise and play. By 2001, the show's research team consisted of head researcher Alice Wilder, Alison Sherman, Karen Leavitt, and Koshi Dhingra. [note 3] The research team and creators worked collaboratively. Unlike Sesame Street, which tested a third of its episodes, the Blue's Clues research team field tested every episode three times with children aged between two to six in preschool environments such as Head Start programs, public schools, and private day care centers. There were three phases of testing: content evaluation, video evaluations, and content analysis. In their tests of the pilot, conducted throughout the New York City area with over 100 children aged from three to seven, the show was "immediately successful." They found that as the pilot progressed, children's attention was not only captured and sustained, but they became excited and actively participated with what they saw, to the point that they stood up to get closer to the television and spoke back to the host. The producers and researchers also consulted outside advisers, who were chosen based on their expertise and the needs of each script. As Anderson stated, the formative research team served "as a liaison between the feedback provided by the preschoolers and outside advisers and the production team, including writers, talent, producers, directors, element artists, and animators." When I believed we had the best show on television that could educate preschoolers and positively impact their lives, I was relentless. I wanted so much to give kids a television show that celebrates how smart they are, because I truly believe they are brilliant. I also wanted to create a show that would help pre-schoolers feel good about themselves". Twenty years worth of research had showed that television, a "cultural artifact" accessible to most American children, could be a "powerful educational agent." The show was designed and produced on the assumption that, since children are cognitively active when they watch television, a show could be an effective method of scientific education for young children by telling stories through pictures and by modeling behavior and learning. The creators and producers used film techniques to present information from multiple perspectives in many "real world" contexts, or situations within the daily experiences of young children. They wanted to provide their viewers with more "authentic learning opportunities" by placing problem-solving tasks within the stories they told, by slowly increasing the difficulty of these tasks, and by inviting their involvement. These learning opportunities included the use of mnemonics in the form of mantras and songs, and what Tracy called "metacognitive wrap-up" at the end of each episode, in which the lessons were summarized and rehearsed. The producers wanted to foster their audience's sense of empowerment by eliciting their assistance for the show's host and by encouraging their identification with the character Blue, who served as a stand-in for the typical preschooler. Sesame Street reflected the prevailing view that preschoolers had short attention spans; it featured a magazine-like format consisting of varied segments. Based on research conducted over the 30 years since the launch of Sesame Street by theorists like Anderson, the producers of Blue's Clues wanted to develop a show that took advantage of children's intellectual and behavioral activity when watching television. Previous children's television programs presented their content with little input from their viewers, but Blue's Clues was one of the first children's shows to actively invite its viewers' involvement. Its creators believed that if children were more involved in what they were viewing, they would attend to its content longer than previously expected—for up to a half hour—and learn more. They also dropped the magazine format for a more traditional narrative format. As Variety magazine stated, "... The choice for Blue's Clues became to tell one story, beginning to end, camera moving left-to-right like reading a storybook, transitions from scene to scene as obvious as the turning of a page." Every episode of Blue's Clues was structured in this way. The pace of Blue's Clues was deliberate, and its material was presented clearly. Similar to Mister Rogers' Neighborhood, which also inspired the producers, this was done was in the use of pauses that were "long enough to give the youngest time to think, short enough for the oldest not to get bored." The length of the pauses, which was estimated from formative research, gave children enough time to process the information and solve the problem. After pausing, child voice-overs provided the answers so that they were given to children who had not come up with the solution and helped encourage viewer participation. Researcher Alisha M. Crawley and her colleagues stated that the show was "unique in making overt involvement a systematic research-based design element." In 2002, the success of Blue's Clues inspired the producers of Sesame Street to change its format and add more interactive segments. Blue's Clues also differed from Sesame Street by not using cultural references or humor aimed at adults, as this could confuse preschoolers but, instead, made the show literal, which the producers felt would better hold the children's attention. The structure of each episode was repetitive, designed to provide preschoolers with comfort and predictability. Blue's Clues was set in the home—the environment that was most familiar and secure for preschoolers—and looked like no other children's television show. Each episode was in development, from idea development to final production, for approximately one year. Writers created a goal sheet, which identified their objectives based on the show's curriculum and audience needs. Script drafts, once developed and approved by the show's creators and research team, were tested at public and private schools, day care centers, preschools, and Head Start programs by three researchers, who would narrate the story in the form of a storybook and take notes about the children's responses. The writers and creators revised the scripts based on this feedback. A rough video, in which the host performed from the revised script in front of a blue screen with no animation, was filmed and retested. The script was revised based on the audiences' responses, tested a third time with animation and music added, and incorporated into future productions. Most of the show's production was done in-house, rather than by outside companies as was customary for children's TV shows. The show's creators understood that the look and visual design of the show would be integral to children's attachment with it. Johnson expanded on the "cut-out" style she had created during her college years. Blue's Clues was the first animated series for preschoolers that utilized simple cut-out construction paper shapes of familiar objects with a wide variety of colors and textures, resembling a storybook. Johnson also used primary colors and organized each room of the home setting into groups. The green-striped shirt worn by the show's original host, Steve, was inspired by Fruit Stripe gum. The goals were to make the show look natural and simplistic; as Tracy put it, "freshly cut and glued together with a vivid array of textures, colors, and shadows" similar to picture book illustrations. The music, produced by composer Michael Rubin and pianist Nick Balaban, was simple, had a natural sound, and exposed children to a wide variety of genres and instruments. According to Tracy, the music empowered children and gave the show "a sense of playfulness, a sense of joy, and a sense of the fantastic". Rubin and Balaban encouraged the musicians who performed for the show to improvise. The host performed each episode in front of a "blue screen", with animation added later. The show's digital design department combined high-tech and low-tech methods by creating and photographing three-dimensional objects, then cutting them out and placing them into the background. This made the objects look more real and added perspective and depth. Their animation technique was at that time a new technology. Johnson hired artist Dave Palmer and production company Big Pink to create the animation from simple materials like fabric, paper, or pipe-cleaners, and scan them into a Macintosh computer so that they could be animated using inexpensive computer software such as Media 100, Ultimatte, Photoshop and After Effects,[note 4] instead of being repeatedly redrawn as in traditional animation. Johnson credited Kessler with the idea of using the Macintosh. The result was something that looked different from anything else on television at the time, and the producers were able to animate two episodes in eight weeks, as compared to the sixteen weeks necessary to create a single episode by traditional methods. Their process looked like traditional cut-out animation, but was faster, more flexible, and less expensive, and it allowed them to make changes based on feedback from test audiences. Unlike traditional animation environments, which tended to be highly structured, the animators were given information about the characters and goals of the scenes they would animate, and then given the freedom to work out the timing and look of each scene themselves, as long as their creations were true to the characters and to the story. By 1999, the show's animation department consisted of Palmer, 20 animators, 11 digital designers, and 5 art directors and model makers. By 2002, Nickelodeon had built a "state-of-the-art" $6 million digital animation studio that housed 140 people, including 70 animators. Ratings for Blue's Clues were high during its first season, and it was Nickelodeon's most popular preschool program. It has been described as the first commercial television show for preschoolers that was both educational and profitable. Its creators met regularly with businesses that developed Blue's Clues merchandise and products to ensure toys that were educational and met "the same high ... standards as the show." Products, like the show, were heavily tested prior to marketing. [note 5] Blue's Clues had sold almost 40 million units of its 45 VHS and DVD titles by 1998 and generated over $1 billion in product licensing in 2000. More than ten million Blue's Clues books were in print by 2001 and over three million copies of six CD-ROM titles based on the show had been sold. Seven Blue's Clues titles sold at least 1 million copies each. The show's first direct-to-video production was Blue's Big Musical Movie (2000), featuring Ray Charles and The Persuasions; it received mostly positive reviews and has sold over 3 million copies since 2006. The launch of Blue's Clues products at FAO Schwarz's flagship store in New York City was the most successful product launch in the store's history and was attended by over 7,000 people. By 2002, Blue's Clues had received several awards for children's programming, educational software, and licensing and been nominated for nine Emmy Awards. It also won a Peabody Award in 2001. 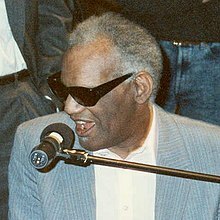 Ray Charles, shown here in 1990, appeared in the popular Blue's Clues VHS Blue's Big Musical Movie. It was his final film role prior to his death four years later, in 2004. Starting in 1999, a live production of Blue's Clues toured the U.S. to positive reviews. Johnson compared the show's audience participation with that of The Rocky Horror Picture Show. As of 2002, over 2 million people had attended over 1,000 performances. The creators of the TV show were involved in all aspects of the live show, aiming to translate the bond between the TV show's audience and its cast to the stage and to provide young audiences with their first theatrical experience. The creators chose Jonathan Hochwald as the live show's producer, Gip Hoppe as its director, and Dave Gallo as its set designer. Neither Hoppe nor Gallo had any previous experience in children's theater. Nick Balaban and Michael Rubin, who wrote the music for the TV show, composed the live show's soundtrack. The producers were concerned with children's response to the host, who was played by Tom Mizer (a different actor than the host of the TV show), but his young audience enthusiastically accepted and embraced him. Actors were encouraged to improvise and respond to the audience, which resulted in changes throughout the show's run. The show's script included humor that both children and their parents could enjoy. Regional versions of the show, featuring native hosts, have been produced in other countries. In the United Kingdom it was hosted by Kevin Duala and the Korean version became part of pop culture in South Korea. In total, the show was syndicated in 120 countries, and was translated into 15 languages. In 2000, it became one of the first preschool shows to incorporate American Sign Language into its content, with between five and ten signs used consistently in each episode. Blue's Clues won an award from the Greater Los Angeles Agency on Deafness (GLAD) for promoting deaf awareness in the media. The show's extensive use of research in its development and production process inspired several studies that provided evidence for its effectiveness as a learning tool. Field tests showed that the attention and comprehension of young viewers increased with each repeat viewing. In 1999, Anderson and a team of researchers, some of which were his colleagues at Nickelodeon, studied how episode repetition affected comprehension, audience participation, and visual attention. The researchers tested whether repeated viewings of the show resulted in mastery over the material presented, or whether viewers would habituate or become bored. They discovered that audience participation was lower for the first few viewings, because children paid more attention to unfamiliar material, and because it was more cognitively demanding to understand and solve the problems presented. After five viewings, more of the viewers' cognitive resources were available for interaction and participation, so they answered more questions. Episode repetition seemed to empower viewers, as shown in their enthusiastic efforts to solve the problems presented to them. Repetition, which the researchers called "an inexpensive tool to maximize comprehension," improved comprehension, held children's attention, and increased audience participation. Children were not only tolerant of repetition, they were "positively enthusiastic" about it. Nielsen ratings of the show's first season, when the same episode was shown daily, were flat over the five-day period, which indicated to Anderson that young children did not tire of its repetition or of its complexity over time. Anderson and Crawley felt that the telecast strategy helped increase the show's ratings and called it a success. In 2000, another team of researchers, including Anderson, Crawley, and other Nickelodeon colleagues, studied whether experienced Blue's Clues viewers interacted more with the show than less-frequent viewers and whether regular viewers of the show interacted more with other shows than did children who were not. They found that when the content of a program was new and challenging, children paid more attention, and when it was familiar, either from previous viewings or in a format they recognized, they instead interacted more. In short, they found that "interaction in Blue's Clues to some extent reflects mastery." A similar study, also conducted in 2000 by many of the same researchers, found that experienced Blue's Clues viewers interacted more with other educational programs than did inexperienced viewers, which proved that watching Blue's Clues changed the way children watch television. Researcher Shalom M. Fisch, however, stated that although the show attempted to be "participatory," it could not truly be so, because unlike interactive computer games, the viewers' responses could not change or influence what occurred on-screen. Jennings Bryant conducted a two-year longitudinal study of the effects of Blue's Clues at the University of Alabama in 2001 to ascertain whether or not the show's curriculum goals were achieved. He compared regular viewers and non-viewers and found that the show's episode repetition strategy improved children's comprehension while holding their attention and increasing their participation, which suggested that watching Blue's Clues increased children's learning and social interactions. At the end of the study, regular viewers outperformed the non-viewers, solving problems more successfully and systematically. Anderson stated, "Given the program's large audience, it appears that the program is not only doing well, but it is also doing good." Actress Marlee Matlin, shown here in 2009, appeared in several Blue's Clues episodes introducing American Sign Language to its young viewers. In 2002, Crawley, Anderson, Kiersten Clark, and their colleagues conducted another study on the effects of Blue's Clues, this time researching whether more experienced viewers mastered the content and cognitive challenges faster and easier than first-time viewers. They surmised that experienced viewers would comprehend and interact more with the recurring and familiar segments of the show designed to aid comprehension, but they found that familiarity with the structure of an individual episode did not provide experienced viewers with an advantage over the inexperienced viewers. Crawley and Anderson also studied whether experienced viewers of Blue's Clues interacted more with other children's TV shows and whether the viewing behaviors they learned from Blue's Clues could be transferred to other shows. They found that although experienced viewers of Blue's Clues interacted with an episode of another series, they did not spend more time watching it than viewers unfamiliar with the show. The researchers stated, "It is apparent that, although preschoolers learn to enthusiastically engage in overt audience participation, they do not, by and large, have a metacognitive understanding of why they do so." The 2002 studies demonstrated that experience with watching one TV series affects how children watch other programs, especially in the way they interact with them. They also showed that since children are selective in the material they attend to and that their interaction increases with comprehension and mastery, children tend to pay more attention to novel information and interact more with material they have seen before and mastered. The researchers predicted that since shows like Blue's Clues help children feel empowered to learn, it could have long-term effects in motivating children to learn and provide them with a lifelong love of learning. Erin Ryan and her colleagues performed a 2009 study on the effect of the use of American Sign Language (ASL) in Blue's Clues episodes. They analyzed 16 episodes over two weeks for the content and frequency of the signs used and found a high incidence of ASL usage by various characters, but that it was inconsistent, especially in the connection between English words and their corresponding signs. The purpose of signed communication and its connection with ASL and the Deaf community was not clearly explained, either. The researchers speculated that hearing children with no previous ASL exposure would be familiarized with ASL and the deaf by these episodes, thus reducing the stigma attached to deafness and hard of hearing individuals. Based on other research about the positive effects of teaching ASL to hearing children, the researchers also speculated that it could lead to an increase of vocabulary skills and IQ, as well as improve interpersonal communication. They surmised that deaf children would feel more included and less isolated and be provided with the opportunity to view positive models of ASL and deaf people. Georgene L. Troseth and her colleagues at Vanderbilt University studied how toddlers use information gained from prerecorded video and from interactions with a person through closed-circuit video, and found that two-year-olds do not learn as much from prerecorded videos because the videos lack social cues and personal references. Two-year-olds who viewed a pretaped video with instructions about how to find a toy in an adjoining room by a non-interactive researcher did not use the information, even though they smiled and responded to questions. Troseth speculated that their research had implications for interactive educational shows like Blue's Clues, which although was "on the right track" due to the way in which the host invites interaction with the show's viewers, did not provide children with the social cues to solve real-world problems. Troseth stated that repetition, repeated exposure, and familiarity with the show's host may increase children's ability to learn facts and to use strategies they learn from Blue's Clues to solve new problems. Her research suggested that Blue's Clues engaged young children and elicited their active participation because they mimicked social interaction. A longitudinal study published in 2005 found that early exposure to Blue's Clues to children between six and thirty months of age was positively linked with vocabulary and expressive language later learned. Main article: Blue's Clues & You! In March 2018, Nickelodeon announced a reboot of the series, with a new host and 20 new episodes. An open casting call for the show's new host occurred in April, and production began in the summer of 2018. In September 2018, it was announced that the show will be titled Blue's Clues & You!, and Joshua Dela Cruz will be the host of the revival. On February 14, 2019, the show was given a November premiere. ^ Tracy's book is a business guide based on Nickelodeon and the history of Blue's Clues. Publishers Weekly noted the value in Tracy's discussion of the creators' and producers' business model but found Tracy's tone "less then [sic] optimal for discerning executive readers." ^ Burns was involved in Patton's selection. ^ Alice Wilder joined the team shortly after its debut and, according to Tracy, reinvented the role of research in children's television, as well as helping to train the writers and animators to trust and use research. ^ Adobe Systems was surprised that their products were being used in the production of a children's television show. According to Tracy, "Not even the developers of the software knew it could be used to create character animation on the scale Blue's Clues was using it". Adobe later requested that the show's animators join their client development group, and made several changes and improvements to their software as a result. ^ In order to keep the integrity of the Blue's Clues brand intact, a branding guide "bible" called Blue's Clues 101 was created that explained the show and provided examples of products that both correctly and incorrectly reflected it. ^ a b c "Blue's Clues". Nickelodeon Animation. Burbank, Calif. Retrieved 6 July 2018. ^ a b c d e f Jim Forbes (narrator) (27 July 2006). Behind the Clues: 10 Years of Blue (Part 1) (Short documentary). Nickelodeon. Retrieved 1 June 2018. ^ a b Calvert, Sandra L; Kotler, Jennifer A. (2003). "Lessons from children's television: The impact of the Children's Television Act on children's learning". Applied Developmental Psychology. 24 (3): 278. CiteSeerX 10.1.1.727.4871. doi:10.1016/S0193-3973(03)00060-1. ^ "Blue's Clues for Success: The 8 Secrets Behind a Phenomenal Business". Publishers Weekly. 17 May 2002. Retrieved 1 June 2018. ^ Swartz, Mimi (2004). "'You dumb babies! : How raising the Rugrats babies became as difficult as the real thing". In Hendershot, Heather (ed.). Nickelodeon Nation: The History, Politics, and Economics for America's Only TV Channel for Kids. New York: New York University Press. p. 114. ISBN 978-0-8147-3651-7. ^ Hayes, Diane Aden (1994). "The Children 's Hour Revisited: The Children ' s Television Act of 1990". Federal Communications Law Journal. 46 (2): 295. Retrieved 26 June 2018. ^ a b c d Carter, Bill (21 June 2000). "TV NOTES; 'Blue's' Creator Wouldn't Stay". The New York TImes. Retrieved 5 July 2018. ^ Gladwell, Malcolm (2000). The Tipping Point: How Little Things Can Make a Big Difference. Boston, Massachusetts: Little, Brown and Company. p. 110. ISBN 978-0-316-34662-7. ^ Hayes, Dade (2008). Anytime Playdate: Inside the Preschool Entertainment Boom, or, How Television Became My Baby's Best Friend. New York: Kaplan Publishing. p. 67. ISBN 9781416546832. ^ Anderson, Daniel R. (2004). "Watching children watch television and creation of Blue's Clues". In Hendershot, Heather (ed.). Nickelodeon Nation: The History, Politics, and Economics for America's Only TV Channel for Kids. New York: New York University Press. p. 241. ISBN 978-0-8147-3651-7. ^ a b c Mifflin, Lawrie (3 August 1997). "The Joy of Repetition, Repetition, Repetition". The New York Times. Retrieved 7 July 2018. ^ "You're in good company: Alice Wilder '88". Skidmore Fund. Saratoga Springs, N.Y.: Skidmore College. Retrieved 7 July 2018. ^ a b c d Jim Forbes (narrator) (2006-07-27). Behind the Clues: 10 Years of Blue (Part 2) (Short documentary). Nickelodeon. ^ Heffernan, Jennifer (26 January 2007). "Calling Blue: And on That Farm He Had a Cellphone". The New York Times. Retrieved 23 August 2014. ^ "Nickelodeon's Blue's Clues is Back, Remade for a New Generation of Preschoolers" (Press release). Nickelodeon. March 6, 2018. Retrieved March 11, 2018 – via BusinessWire.com. ^ "Nickelodeon Unveils Content Pipeline of More Than 800 New Episodes, Details Expansion into Location-Based and VR Experiences" (Press release). Viacom. March 6, 2018. Archived from the original on 2018-03-12. Retrieved March 11, 2018. ^ Bradley, Bill (15 December 2016). "Steve Burns Finally Confirms Why He Left 'Blue's Clues'". Huff Post. ^ "The One Show - Kevin Duala - BBC One". BBC. ^ Butler, Karen (10 March 2018). "Nickelodeon is bringing back 'Blue's Clues' with a new host". UPI. Retrieved 11 June 2018. ^ Boucher, Ashley (6 March 2018). "Nickelodeon to revive 'Blue's Clues' with 20 new episodes". San Francisco Chronicle. Retrieved 11 June 2018. ^ Petski, Denise (13 September 2018). "Nickelodeon's 'Blue's Clues' Reboot Gets New Host & New Title". Deadline. Retrieved 18 September 2018. ^ Petski, Denise (February 14, 2019). "'SpongeBob' Spinoffs, 'All That' & 'Are You Smarter Than 5th Grader?' Revivals & More On Nickelodeon's 2019 Content Slate". Deadline. Ryan, Erin; Cynthia Nichols; Melissa Weinstein; Rebecca Burton. (2009). "Helping Hands? The Use of American Sign Language in Nickelodeon's Blue's Clues." Conference Papers—International Communication Association: 1–37. Tracy, Diane. (2002). Blue's Clues for Success: The 8 Secrets Behind a Phenomenal Business. New York: Kaplan Publishing. ISBN 0-7931-5376-X. This page was last edited on 25 April 2019, at 18:40 (UTC).